The EAC highlights Scott Carter, Stephen Cartwright and Emily Hermant. 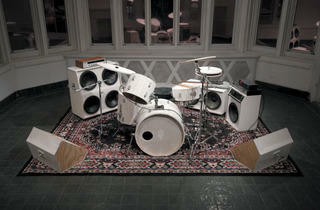 Photograph: Courtesy of the artist Scott Carter, Disonar, 2013. Every hour since noon on June 21, 1999, Stephen Cartwright has recorded his exact position on Earth with a handheld GPS. His ongoing Latitude and Longitude Project is on view with works by Emily Hermant and Scott Carter, whom threewalls executive director Shannon Stratton also selected for this exhibition from the EAC’s 2012 Evanston + Vicinity Biennial. All three artists use labor-intensive processes that yield expressive, multilayered works. Cartwright’s long-exposure photographs of light add welcome pops of color to his show. Generated using an XY LED plotter that he built (on display in the gallery), they visualize his GPS data, tracing his hourly movements in Champaign-Urbana and other cities. The reinforced triangles in the middle of each digital print represent well-trod trails such as his path between home, work and studio. Hermant’s Spatial Drawings (2012) are graceful, dynamic sculptures fashioned from hand-bent hardwood planks and C-clamps in tension, painstakingly formed into unexpected bends and loops. While the specifics of her process remain a mystery, the presence of a few strategically placed studio objects—a dustpan, a broom—emphasize these effortless-looking works were constructed with great care. 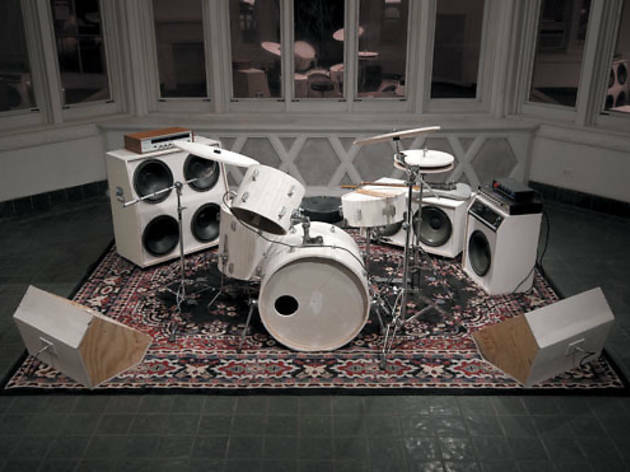 Carter uses common building materials including cement and drywall to replicate a drum kit, electric guitar and speakers in Disonar (2013). While his inclusion of actual guitar parts and stereo receivers is what makes these instruments playable, the artist’s craftsmanship is so impressive we wish he had fabricated all of the elements, creating a work more fantastic than functional. Over time, however, the drywall will crumble and the sculpture will fall apart. It will be a wholly different piece by April.